Even if you’re not familiar with the entire Glico product lineup, if you’ve spent time in Japan, browsed through the snack food aisle of an Asian supermarket, or even watched much anime, odds are you’ve seen Pocky, the chocolate-covered candy sticks the company has been selling since 1966. Pocky has enjoyed widespread popularity for decades. It seems it didn’t just catch the eye of chocolate lovers, though, but also of product planners at Lotte, the conglomerate founded in Japan but with the majority of its operations now in South Korea. In 1983, Lotte rolled out a product called Pepero in the Korean market, and whether or not you think the idea of “chocolate-covered sticks” constitutes a defensible intellectual property, you have to admit the packaging is kind of a rip off. With over three decades having passed since its launch, it’s likely too late for Glico to do anything to halt Pepero sales now. Thankfully, the questionable competition hasn’t broken Glico, as the company continues to do well. One of its recent hits is an upscale offshoot of the Pocky formula called Baton d’Or. Available exclusively at Osaka department stores, the candy is differentiated from plain old Pocky by its thicker sticks and special buttery, chocolate coating. It’s such a hit that customers regularly line up ahead of time to get their hands on some before the day’s batch is sold out, even though it’s quite a bit more expensive than Pocky at 501 yen (US $4.25) a box. 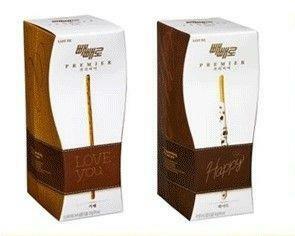 Speaking of boxes, here’s what the box looks like for Lotte’s fancier version of Pepero, called Premier Pepero. Huh. Well isn’t that a coincidence? Or it would be, if it weren’t for the fact that Baton d’Or has been available since October of 2013, and Premier Pepero was just unveiled in Korea in November of 2014. Not surprisingly, Glico’s executives and lawyers see more than a passing resemblance in Lotte’s tall package that features a kink halfway up the box, wavy line separating a field of white from a contrasting color, and single upright stick depicted on the front. And though imitation may be the sincerest form of flattery, Glico has responded to the unsolicited compliment not with a cheerful “Thank you,” but with a stern lawsuit filed in Korean court seeking to bar the sale of Premier Pepero. …and Meiji’s own Pocky-like Fran, seen here with ironically named Korean imitator Friend. Really, some of these are so blatantly cases of one copying the other that it’s hard to look at them and not find yourself craving a little justice…and also a whole lot of candy.